A huge congratulations to all our wonderful musicians who participated in The HKGNA Music Festival 2016. Brilliant, Inspiring and Sensational performances all around! We are so grateful to all the artists, sponsors, staffs, interns,and the audience for the wonderful support! We look forward to seeing you at our next festival in 2017! Our music festival will kick off with “HKGNA Music Competition 2016,” where we will give a dream-come-true opportunity for the grand prize winner to perform in Carnegie Hall, New York. This prize is supported by our friends at theHong Kong Economic and Trade Office in New York and a part of the celebration in the US for the 20th year establishment of HKSAR. The festival will then present a series of exciting concerts and events with world renowned international guest artists and Hong Kong’s best musicians performing together with our HKGNA emerging artists. Our fantastic line-up of top international artists includes Violist Richard Yongjae O’Neill, Violinist Hyuna Kim and Cellist Minhye Clara Kim. Richard O’Neill is a classical super star and a two time Grammy award nominee. He is the Artistic Director of chamber music initiative DITTO and a Goodwill Ambassador for the Korea Red Cross and UNICEF. Hyuna Kim debuted with the Seoul Philharmonic at age 10 and performed with the Philadelphia Orchestra, Shanghai Philharmonic and Salzburg Kammerphil, among many others. Minhye Clara Kim has performed all over the world as a soloist, recitalist, and chamber musician. She was the youngest ever faculty member to be appointed to the string faculty at the Juilliard School Pre-College Division. She is also faculty member of Columbia University and the Perlman Music Program and her students are sweeping major competitions worldwide. Our all-star guest artists will also perform with Hong Kong’s own Academy for Performing Arts Symphony Orchestra under the direction of Dr. Sharon Andrea Choa. Central to our mission, our world-class artists will share their gifts and talents with our HKGNA emerging artists on stage and off stage giving a series of one-to-one masterclasses open to the public. HKGNA Stars and Friends concert featuring HKGNA Music Competition winners and HK’s best musicians and beloved artists Pianist Nancy Loo, Violinist Jing Wang, and beautiful soprano and Miss Hong Kong runner-up Ada Pong. We are excited to introduce a fantastic Croatian violinist Tomislav Ištok and HKGNA’s very own wonderful tenor Patrick Yeung. We are extremely proud to present our Grand Prize Winners from our 2010 and 2014 HKGNA Music Competition and to introduce our 2016 Grand Prize Winners! Finally, we are proud to present a free music therapy workshop, “Music Is Healing!” open to the public. It will be focused on youth with developmental issues such as Autism, Asperger’s, ADHD and senior associated diseases such as Dementia and Alzheimer’s. Please come and join us at this year’s festival concerts and events. 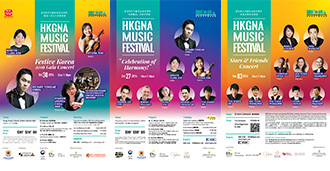 Hope you can experience and celebrate the transformative power of music with us at HKGNA Music Festival 2016! A registered Hong Kong Charity, Hong Kong Generation Next Arts Ltd (HKGNA) was founded in 2009. Our mission is to inspire and nurture artistic excellence and personal success in our next generation of young artists and to transform lives through music.